The genus name comes from two words, one of which means shade-tail (Sciurus). The species name refers to the fact that this species was first discovered on Hudson Bay. The geographical distribution of the North American red squirrel ranges from Alaska, the Yukon, the Northwest Territories, and Quebec southward as far as the Rocky Mountains of New Mexico and Arizona in the west and the Appalachian Mountains of South Carolina in the east. 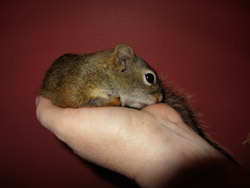 With the exception of the flying squirrel, North American red squirrels are the smallest species of tree squirrel in North America. 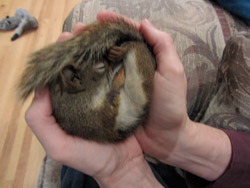 The squirrel measures about 30 cm (approx. 12 inches) from the nose to the tip of the tail and weighs about 225g-300g (approx. 8-11 ounces). The red squirrel is not actually red, but rather reddish-orange in color. The fur on the back and sides of the red squirrel is brownish-red and the underparts are white with a black stripe separating the two colors. They have a prominent white eye-ring and the tail is reddish on top and gray underneath. This species of squirrel molts its fur coat twice each year. Red squirrels are diurnal (active during the day) although they may occasionally be active during the night. Activity patterns are strongly influenced by weather patterns; high winds, rain, snow, and low temperatures reduce activity. 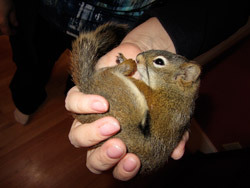 Red squirrels do not hibernate during the winter months except those living in the far north of Canada. Most activity at this time of year occurs during mid-day hours when temperatures are highest whereas in summer the squirrels are most active during early morning and late afternoon hours. Other calls made by the red squirrel include the Bark, Squeaks, and Growls. A bark is most often given in a long series, sometimes lasting for several minutes up to an hour. Squeaks are given in response to a potential threat and increase in intensity if the threat does not diminish. They often progress into barking sessions. Growls are most commonly heard during chases and fights over territories or females. 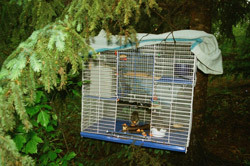 Squirrels caught in live traps will also growl when approached. The red squirrel may also stamp its feet and jerk its tail when upset. The red squirrel’s bushy tail has hairs that can be up to 4 inches (10 cm) long. The purpose of the tail is to maintain balance while the squirrel leaps from branch to branch. When the animal sits, the tail may be laid up over its back. It also serves to keep them warm in the winter. Red squirrels feed mainly on seeds of coniferous trees, (pine, spruce, and hemlock cones), but they also eat nuts, berries, mushrooms, insects, bird eggs, nestlings and a wide range of other items. 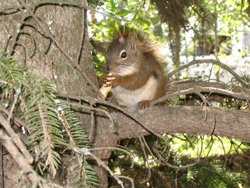 White Spruce habitats are favored by red squirrels because of the highly palatable seeds. Red squirrels are so dependent on the white spruce trees that population density is directly related to seed crop cycles. Cones and seeds are gathered in summer and fall and stored for winter in hiding places called caches. The squirrel marks each spot with a special scent. Squirrels use their sense of smell to locate pinecones that are as much as 12 inches (30 cm) under the snow. Caches may be located in small burrows, tree hollows or in “middens” in coniferous forests. The squirrel feeds sitting up on the hind legs and holding food in the front paws. After eating, the squirrel leaves piles of cone cuttings and nutshells behind. These accumulations are the middens. The red squirrel typically only feeds at one or two favorite places within their territory and the debris can pile up to considerable depths. The midden, the territory surrounding the midden, and the center of activity are vigorously defended from all intruders. Each territory (midden site) is occupied by a single squirrel, with the exception of females with young. Midden sites may be occupied by a succession of different squirrels for decades. Red squirrels use three general types of nests where they feed, sleep, give birth, raise their young, and stay warm in winter. Cavity nests are made inside hollow dead trees (snags) and appear to be the preferred nest type, especially for giving birth to and rearing young. Bolus nests are constructed from twigs, bark, grass, lichen, and leaves. They are formed into a ball then placed on a branch or branches of a tree. Nests have been found as high as 65 feet (20 m) above the ground. Ground nests are located in underground tunnels, often tunnels left from a rotted tree root system. Nests are often constructed under logs covered with deep snow. These nests are only used for one winter and provide easy access to the squirrels’ food caches as well as protection from predators and the weather. Red squirrels become sexually mature at about one year of age and usually mate in early to late spring (sometimes as early as February or March). Females are in estrus for less than a day and may be pursued by and/or solicit the attentions of several males. This activity often leads to raucous breeding chases involving many squirrels that may last for several hours. The pregnancy lasts about 7 weeks, so the young are born in late spring or early summer. A second litter may come in late summer. A litter usually numbers 2 to 6 young, who are born furless and sightless. 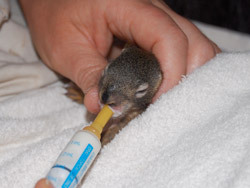 In a few days, fur appears on the young squirrels, but it takes about 5 weeks for their eyes to open. The young are nursed in the nest for about 45 days before emerging. The mother squirrel keeps the babies clean by holding them while she licks them. 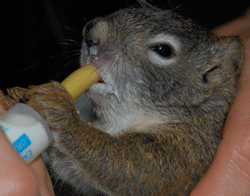 Baby squirrels spend much of their time playing and learning to obtain food. 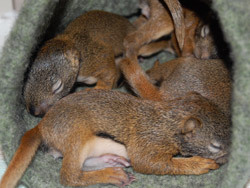 By early fall the young squirrels are ready for life on their own. Only about 25% of red squirrels survive to become adults. Squirrels surviving to adulthood can live to be about 10 to 12 years old although the average life expectancy is closer to three years. The main predators of red squirrels are hawks, owls, coyotes, and weasel-like creatures called pine martens. Squirrels escape from predators by running down tree trunks in a spiral or climbing to the top of a tree and jumping to the ground. 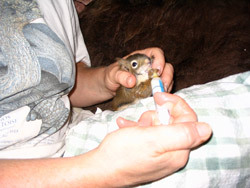 Squirrels contribute to the health of the forest habitat. When squirrels bury nuts and seeds and forget to come back to get them, the forest is actually being re-seeded. 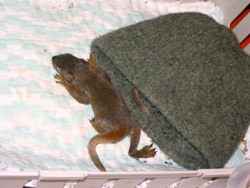 Infant red squirrels are sometimes found when trees are cut down or are blown down in a storm. They should be taken to the nearest wildlife rehabilitator to be cared for. They do not make good pets due to their hyperactivity and tendency to bite.